Otoritas : Jurnal Ilmu Pemerintahan, with registered number ISSN 2088-3706 (Print), ISSN 2502-9320 (Online), or translated in English as Authority : Journal of Government Studies is a peer-reviewed journal published twice a year in April and October by Department of Government Studies, Faculty of Social and Political Sciences, Universitas Muhammadiyah Makassar in collaboration with Muhammadiyah’s College Association of Government Studies (AIPPTM) and Asia Pacific Society for Public Affairs (APSPA). Otoritas : Jurnal Ilmu Pemerintahan has been accredited by National Journal Accreditation (ARJUNA) Managed by Ministry of Research, Technology, and Higher Education of Republic Indonesia with Second Grade (Sinta 2) since 2016 to 2020 according to the decree No. 21/E/KPT/2018. Otoritas : Jurnal Ilmu Pemerintahan aims to publish conceptual, review and research articles in the field of Governmental Science and focuses on the issues of Governmental Science involving the interaction between governance in government; bureaucracy; policy and public services; governmental politics; Islamic politics and government; government innovation; community empowerment; leadership; regional autonomy; terrorism and conflict resolution; government ethics; leadership; and E-Government. 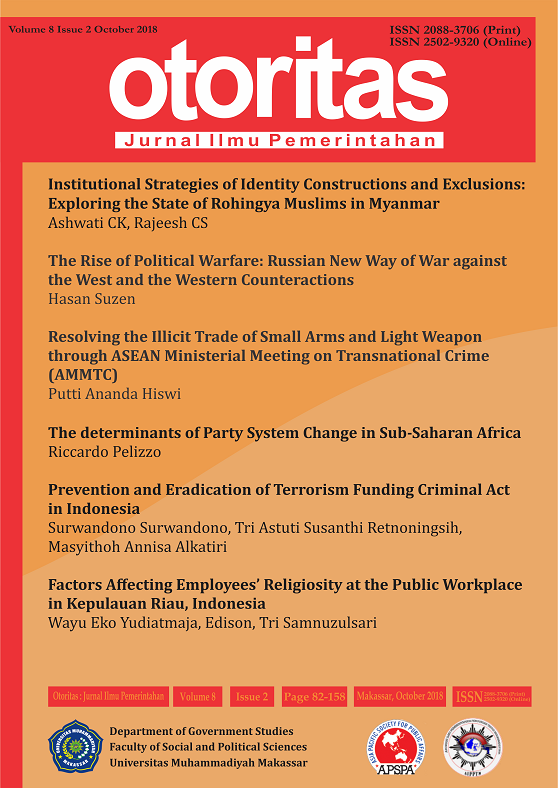 The articles published in Otoritas : Jurnal Ilmu Pemerintahan have been double blind-reviewed by peer reviewers. The decision on whether the scientific article is accepted or not in this journal will be the Editorial Board’s right based on peer reviewer's recommendation. Please read and understand the author guidelines thoroughly. Author who submits a manuscript to the editors of Otoritas : Jurnal Ilmu Pemerintahan should comply with the author guidelines. If the submitted manuscript does not comply with the guidelines or using a different format, it will be rejected by the editorial team before being reviewed. Editorial Team will only accept a manuscript that meets the specified formatting requirements. The journal registered in the CrossRef with Digital Object Identifier (DOI) prefix 10.26618.